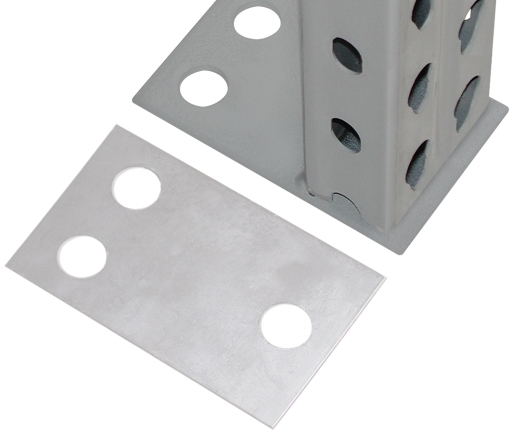 Uprights conform to the latest standards set by Rack Manufacturers' Institute LRFD Specifications. Unique Design - Roll formed upright provides greater strength-to-weight ratio. Minimum-sized slots mean more steel per upright. Upright's structures are 100% mig-welded with precision K-brace and heavy-duty cross channel reinforcement for increased strength, rigidity and resistance to abuse. Easy Adjustment - Tapered keyhole slots on 2" centers, provide quick, easy vertical adjustment of beams. There are no "dead spots" or obstructions in upright posts to impede movement of beam along the entire height. Interchangeable - Lyon pallet rack fits with other traditional teardrop designs. 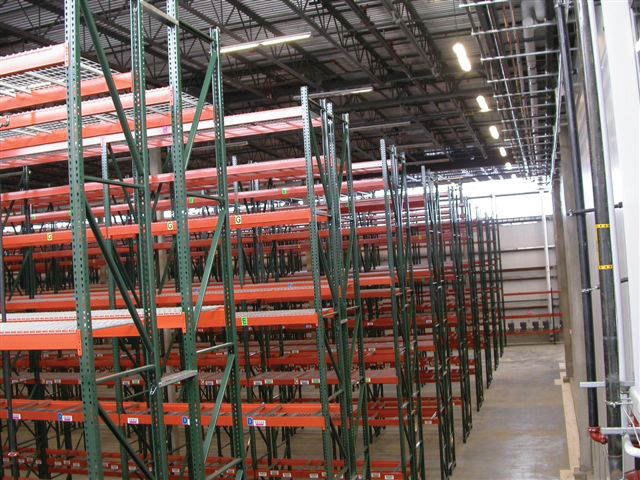 That means you can upgrade damaged, weak, or worn out uprights and beams with our versatile rack. No need to change your whole system. Determine "Largest Beam Spacing". Vertical distance between floor and first beam level or vertical distance between beam spacing; whichever is greater. Refer to the Upright Capacity Chart. Find the "Largest Beam Spacing" number that closest resembles the number determined in Step 2. Move down the table to the desired capacity required. This will identify if the upright is Medium or Heavy-Duty. Using the required depth and height of the upright for the corresponding type identified in Step 3, select the appropriate catalog number from the table. 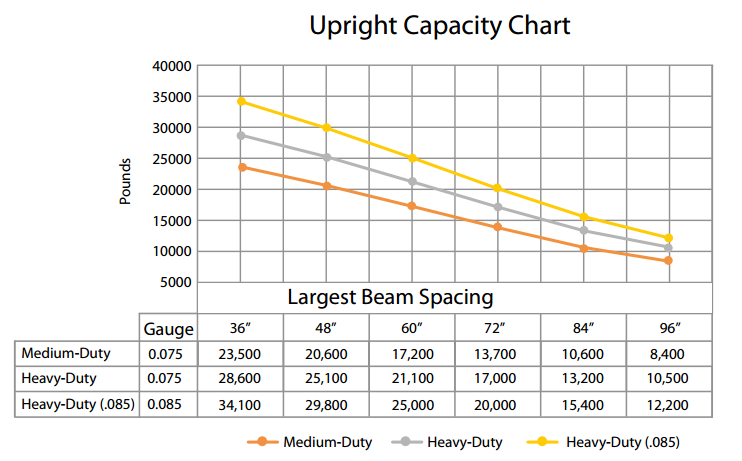 Largest Beam Spacing has a significant impact on the capacity rating of an upright. Three-Point Safety Catch - Each beam has 3 rugged studs (4 on heavy-duty) that engage the tapered keyhole slots in the upright with a compression fit. 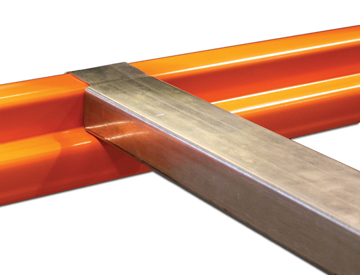 Integral safety lock automatically locks into place when beam is properly seated. Beams 120" long and greater should be tied together with at least one front-to-back support except when solid decking panels are used. Beams conform to the standards set by the latest Rack Manufacturers' Institute LRFD Specifications. Determine load weights per pair of beams. (Two 2,500 lb. pallet loads = 5,000 lb. beam capacity). Determine length of beam required based on load width and minimum clearances. (Minimum clearance between pallet and upright is 4", or for two 48" pallets, a total of 12". Use 108" beam). Refer to desired beam length and move across table to rated capacities. (For 108" beam and 5,000 lb. load, select beam B6500108). Heavy, 14-gauge panels feature three 3" x 1⅝" x 14-gauge hat channels welded to the underside for maximum strength and durability. Panels drop into place to provide a solid deck surface. 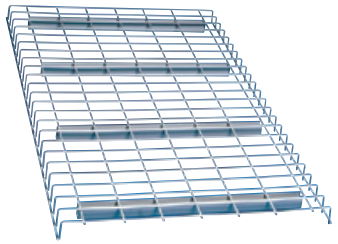 Heavy-duty waterfall decking features a 2½" x 4" 6-gauge wire mesh with 14-gauge steel channels for safe, durable storage and ease of installation. Meets all fire and safety regulations. Available in Frost Gray. 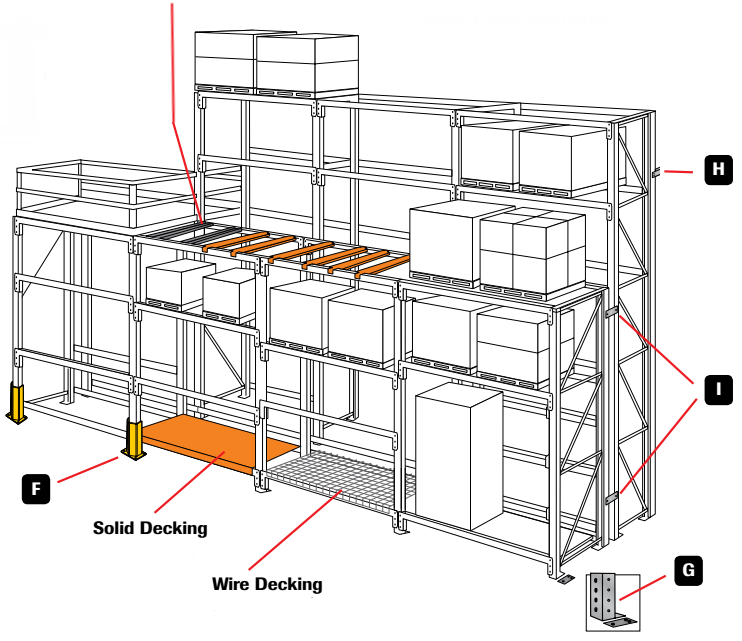 Reduces the likelihood of inaccurately placed pallets falling through. To support plywood or other decking material, or as front-to-back member between beams. Provides secure, easily adjustable base for skid runners. 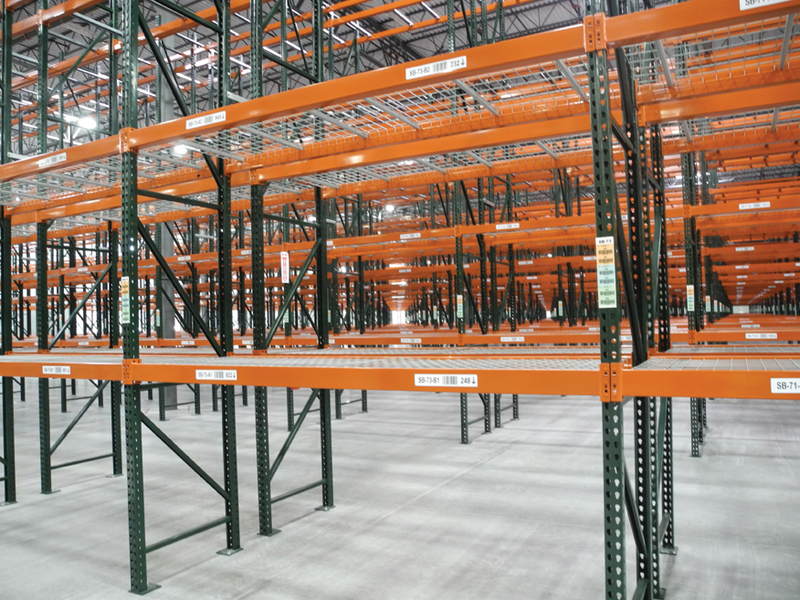 Solid base and proper fork clearance for non-palletized loads. For safe storage of cylindrical items. Welded unit fits securely on beams. Provides extra protection against abuse. Bolt on the floor only. Finish is Safety Yellow. 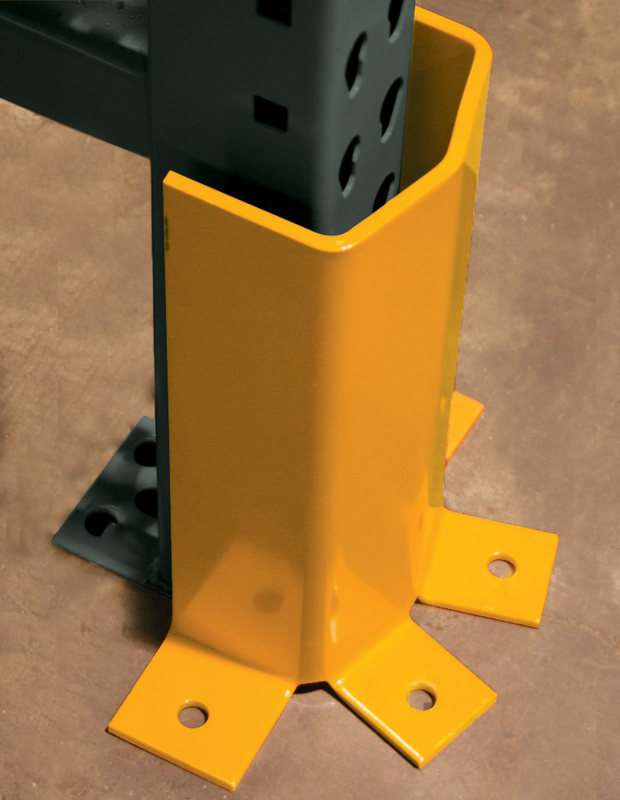 Optional wedge-type anchor can be used to secure column posts. ½" dia. x 3¾" long. 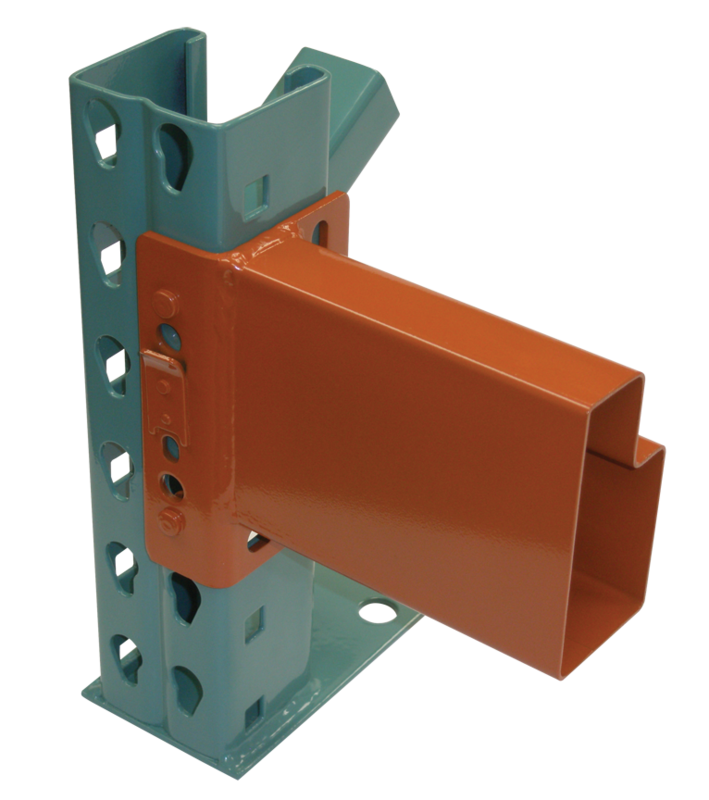 Row spacer provides a stabilizing connection for back-to-back rows of racks; wall ties provide stability and consistent spacing from the wall. Galvanized construction resists rust and corrosion. Two spacers recommended for each pair of uprights. Bolts included. NOTE: Load-carrying capacities for individual accessories listed are based on evenly distributed loads and are limited by the support capacity of the beams and/or upright assemblies. When skid supports, fork-entry bars and/or front-to-back supports are used to support the load, the weight is not evenly distributed to the beam and, therefore, beam capacities are reduced significantly.